The day was a little more cheery when we left Penola but still had a greyish tinge. 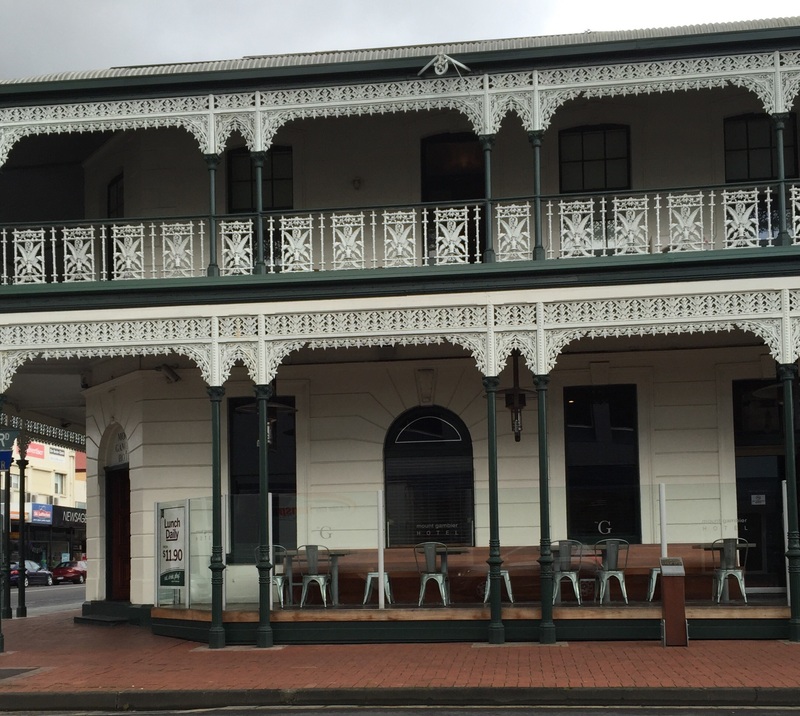 We drove out passing examples of the ironwork on the old buildings which we have seen in evidence since Adelaide. Things had , however brightened when we made our first stop at Port McDonnell – we had reached the coast again. At Port McDonnell we drove out on to the headland to Northumberland Point where we found a signpost that told us we were at the furthest point ( it does not look it on the map!) of Australia and the area nearest the South Pole. There were a number of stories of shipwreck and the bravery of the locals. A particular hero seemed to be a Mr Germaine who was the lighthouse keeper. Regrettably the Fairy Penguin colony was not in evidence……. The scenery was spectacular. 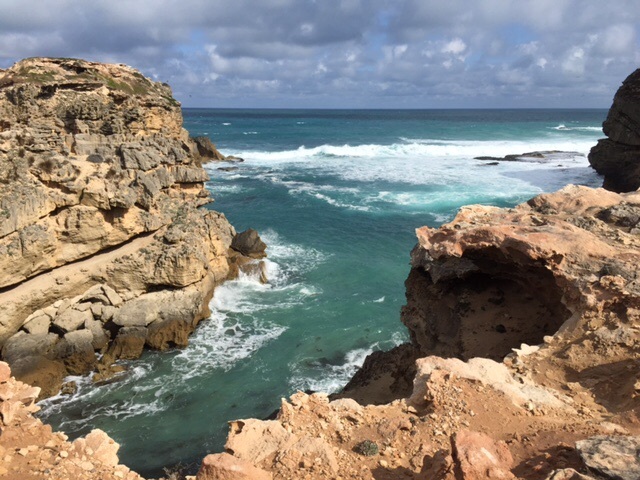 after another fishy lunch, we left Port MacDonnell and our route took us away from the coast and out through vast pine forests. The trees stood very tall and thin in serried rows either side of the road. There were tracks leading into the trees and vast areas where the timber had been cleared. The main traffic coming towards us were huge timber lorries that created a strong vortex of air as they passed. 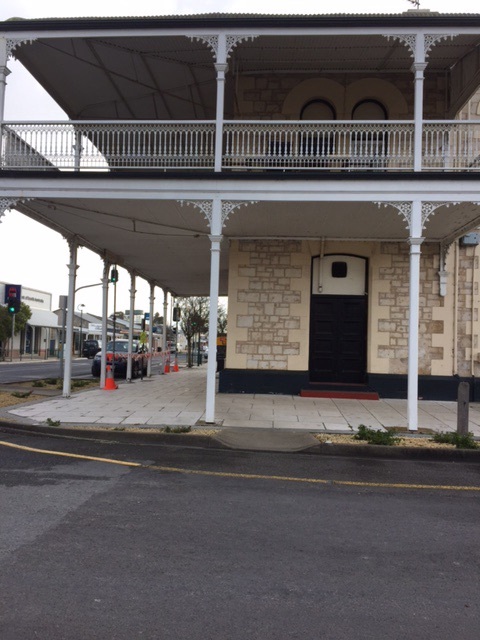 Eventually we reached the small community of Nelson (we were to see signs to Hamilton further along the road) and it was not long past here that we came to the border and crossed into the State of Victoria. 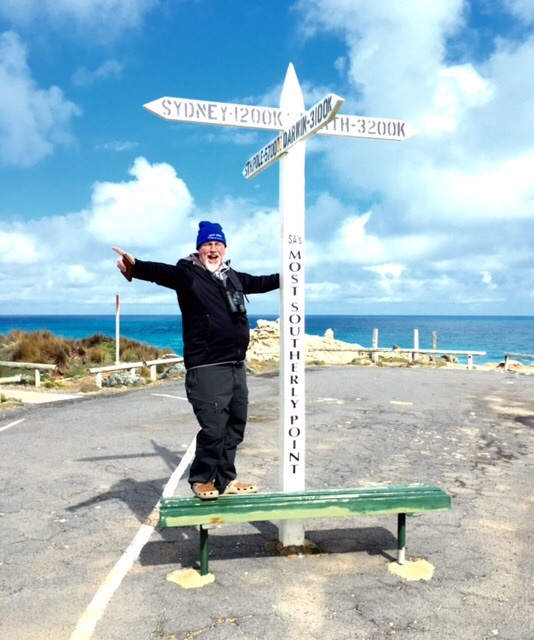 It took us a little while to realise that we had also crossed a time zone which was why the sat nav was giving us such a long time to get to Port Fairy – the time had moved on 30 minutes unknown to us!! 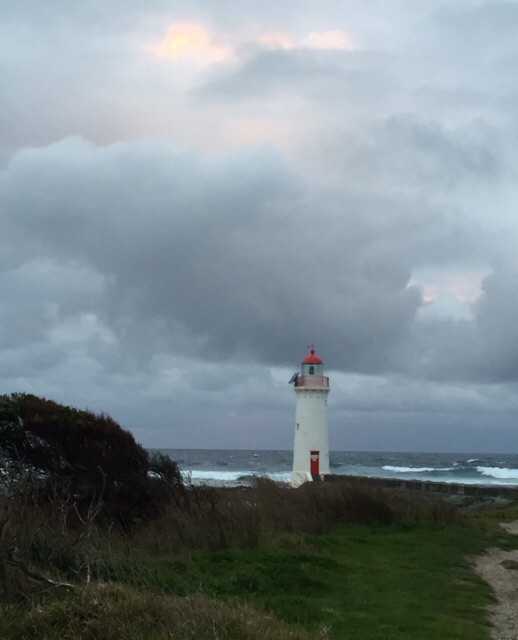 in the gathering gloom we arrived at Port Fairy where Keith had booked accommodation ahead. Our room looked over the river where cormorants sat preening on the landing stages along the riverbank. So as to make the most of the day and to stretch our legs we decided to walk Griffiths Island a small land mass off the coast. Despite the gathering storm clouds we set out across the bridge to the island with the sound of the sea dominating our senses to our far right. There were signs warning us of the Sheerwater (a local rare bird apparently) nesting ground to our immediate right. K was very excited at the thought of seeing a Sheerwater. We did not of course hear or see a peep of them – and who blames them. By now the wind was howling, the sea was roaring and the gathering gloom had moved on to quite dark! We arrived at the lighthouse and then set off over the sand with the waves lapping up the beach and me wondering whether we just had not seen the notice about tides…… I quickened my pace just in case! Our guide was arrows on poles that were fast disappearing in the darkness and I for one was very happy to see the lights of the information hut as we turned the final corner! Back on the mainland it was completely dark and it felt quite late although it was only about 6.30. We looked at a number of eating places, many of them Italian surprisingly, before we opted for a Thai meal which was a change to our usual fare. Our accommodation supplied free port which I have to say we took advantage of to fend off the frustration of no wifi. My blog pages were backing up! Shearwaters are very much ocean-going birds and migrate many thousands of kilometres during the year, returning to their breeding grounds only for the season. They nest in burrows; often returning only at night. So even if they were there, you may not be able to see them.